1, 1-lb. bag of dried beans or blackeyed peas. Bone from 1 smoked picnic ham, preferably with some meat still attached. Rinse beans and soak in 2 quarts water for 6-8 hours or overnight. Drain. Place ham bone and beans in a large saucepan or dutch oven and cover with fresh water. Bring to a boil, reduce heat, cover and cook slowly for 1 hour ur until beans are tender. Salt and pepper to taste. This entry was posted in Fundraisers on November 23, 2015 by kviversen. Bring turkey carcass and water to a boil. Reduce heat, cover, and simmer 2 hours. Remove bones and pick all meat from bones. Return meat to broth. Add remaining ingredients. Simmer for 1 hour or until vegetables are tender. Download the brochure, Care of Your Smoked Turkey or Ham. Our club has carefully smoked your turkey or ham for about 8 hours using hickory and/or pecan wood. Here are some safety tips to make your holidays the best. Keep it cool – If you are not going to eat the turkey or ham within 3 or 4 hours, cool it as quickly as possible. A good way to quickly cool it is to place it in the freezer overnight. In the morning, put the cooled meat in the refrigerator until you are ready to eat it. Or keep it hot. Never leave your turkey or ham at room temperature for more than two hours. Either keep it hot, above 140º F, or refrigerated below 40º F.
Enjoy the leftovers. Leftovers kept in the refrigerator are best if used within four days. Freeze the rest. Frozen leftovers may keep for several months. Food may be frozen longer and remains safe, but it tends to lose its flavor and become drier. When reheating, bring the internal temperature up to 165º F.
The Saturday and Sunday before Thanksgiving is full of action. This is what happened in 2015. We had a crew cleaning up the facility, disinfecting all surfaces, and scraping the grills. Don scraping the grill. Make sure he’s out before we light the fires! Fires were lit a few hours earlier. A big crew prepped the meat for the first batch and got them on the grills. A crew of Civitans remained overnight to keep the fires going and rotate and baste the meat. The first batch of turkeys and hams are taken off and packaged. The second batch is prepped and put on the grills. The overnight crew goes home to rest, a new crew stays during the day to maintain the fires and rotate & baste the meat. Customers pickup their purchases. The second batch comes off around 2:00 PM. We’re handling credit card payments for the first time! The Auburn Civitans were once again squeezing apples on a manual press to make cider for folks attending Pioneer Days in Loachapoka on Oct. 17. This event supports the Lee County Historical Society. Attendees, especially kids, were lined up to try their hands at the press and their mouths on the cider. Always a popular part of Pioneer Days, we used nine bushels of apples, purchased from an apple farm in northern Alabama. This entry was posted in Service Projects on November 17, 2015 by kviversen. 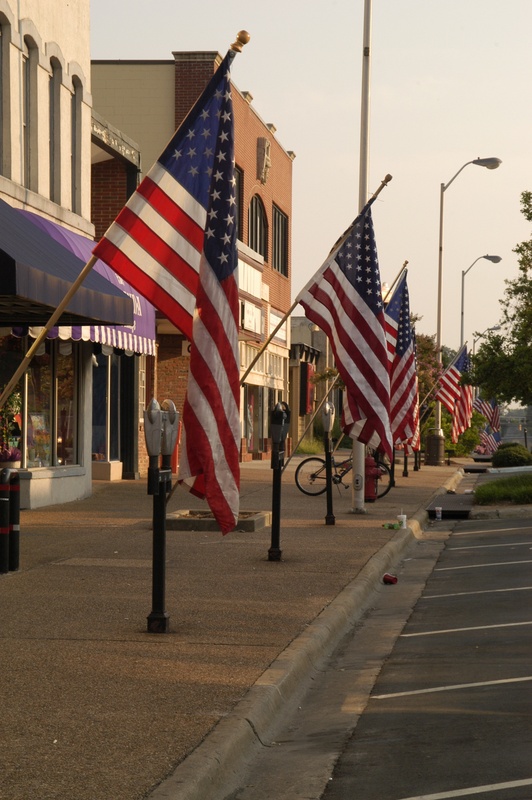 Flags were flying in downtown Auburn today for Veterans Day. We added flags to the tall light posts, 12 feet up. Looked good! As parking meters come down, more flags will be going on the light poles. This entry was posted in Service Projects on November 11, 2015 by kviversen. 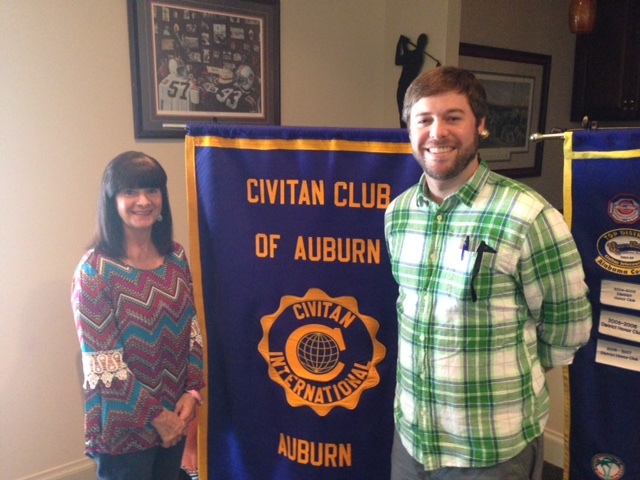 Dana Stewart (l), Lee County Special Olympics, and Barclay Bentley (r), Auburn Civitan member. Dana Stewart of the Lee County Special Olympics spoke to the club on October 16 at the Auburn University Club. The Special Olympics program is one that the Club supports throughout the year, especially the bowling tournament, track and field, swimming, and flag football events. This entry was posted in Programs, Service Projects on November 10, 2015 by kviversen.